I am well and truly into nesting mode at the moment, and have been slowly accumulating baby-shaped items and clothes for the little one. I bought lots of white newborn vests, bibs and soft muslins and thought they would be the perfect thing to try a bit of natural dyeing on. I was inspired by reading this brilliant tutorial by Rebecca Desnos on avocado dyeing, and then decided to download her excellent e-book which has loads more ideas and information about extracting natural dyes. I would wholeheartedly recommend buying it if you're interested in natural dyes - it's really clear and comprehensive, and totally beautiful to look at as well! Extracting dye from natural items is an incredible thing and after my first attempt I now understand why people find it so fascinating and compelling. It seems completely unlikely that such unusual, unique colours could come from something as seemingly inert as an avocado stone, or a sprig of rosemary. Watching the dye emerge from its source is like magic, and I can totally see now why people get hooked on it! For my experiments I used avocado skins and turmeric, as I wanted pinks and yellows. Avocado skins - I used skins from about 15 hass avocados which I had washed and stored in the freezer. The first stage in the dyeing process is preparing the fabric so that the dye will stick to it, known as mordanting. I followed Rebecca's natural mordanting method, using unsweetened soya milk. I bought some own brand soya milk cheaply from the supermarket and followed Rebecca's advice of diluting 1 litre milk to 4 litres of water. 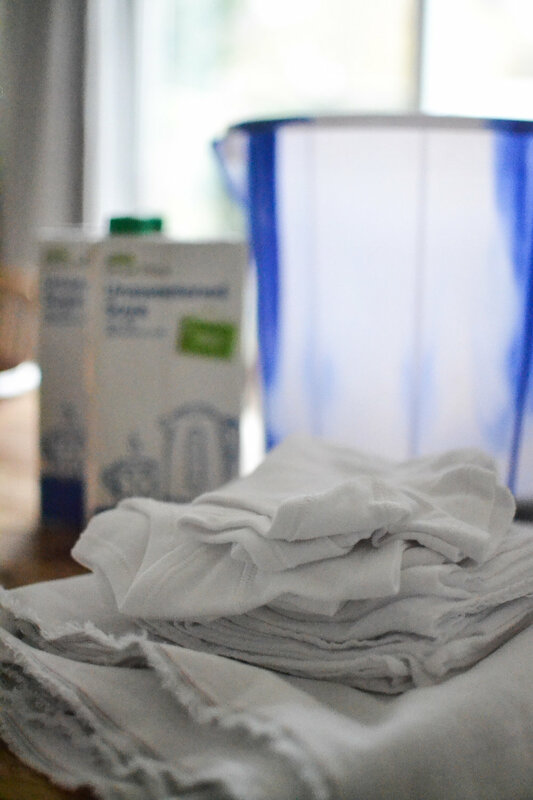 I used 3 litres of milk in total to mordant about 6 baby vests, 6 baby bibs, 6 muslins and two large pieces of linen fabric. As that was quite a large volume of fabric, I had to do it in three batches, spread out over several days. Mordanting the fabric is quite straightforward, but you do need a little time to do it - it took me about a week to do all of my fabric as I had quite a lot. After washing and rinsing fabric (I just put everything on a 20 minute 30 degree quick wash and then put it through the rinse cycle), I then submerged the fabric in the milk/water mixture and left it for about 24 hours. I then rinsed (again using the rinse cycle on the washing machine) and allowed to dry naturally on a drying rack inside. With some of my fabric, I repeated this process (albeit not leaving the fabric for the full 24 hours) but I admit I forgot for some of the rest of the fabric and just gave it one single long soak in the mordant. I decided that given most of the things I was dyeing would not be worn for all that long (I've heard babies grow fast) I wasn't hugely worried about maximising the lasting power of the mordant but if you wanted a more thorough method, it would probably be worth following Rebecca's step by step guide! Once your fabric is mordanted, it's time to prepare the dye bath. I had two baths on the go - one for my avocado skins and the other for my turmeric. I used a smaller, stainless steel pan for the turmeric bath as that was all I had but it seemed to work fine. For the avocado skin bath, I covered the avocado skins with water, brought it to the boil and then simmered until the skins had softened (this took about 1.5 hours). Then, once they were cooled, I broke the skins up into little pieces and simmered again for about an hour. I then poured the dye through a seive lined with a muslin cloth (I just used one of the muslins I was planning to dye anyway), squeezing the skins to extract as much dye as possible and then set aside the skins. Once I removed the skins, I poured the dye back into the pan and heated it for about 2 hours until it had reduced down to about an inch and was a deep red colour. To utilise the mordanting effect of the aluminium, I then left the dye overnight (longer would not hurt if you have the time). The following day I wet my fabric and popped it into the pot, adding enough water to make sure that the fabric was covered and able to be stirred around freely (I clearly needed to add a little more water as I have ended up with some uneven patches). Then it was a matter of gently heating the dye bath with the fabric in it until I was happy with the colour. I left the fabric in for about an hour which gave me quite a dark pink colour. At that point, I removed the fabric, squeezed it out and dried it outside in our side return which is mainly in the shade. Once dried, I put the fabric aside and waited about 10 days before washing it in the washing machine with a small amount of washing powder. My turmeric bath was a complete experiment as I basically just made it up as I went along. Given this, I'm really pleased with how it turned out. I simply filled a saucepan with water, stirred in 1 tablespoon of turmeric and brought to the boil. I put on the lid and simmered for about 1 hour. I then reduced the heat to a gently blip and added the pre-mordanted fabric (the bibs, vests and muslins), leaving it in there for about 20 minutes. This initially gave a very vibrant orange colour to my fabric, which has since faded to a warm yellow, which was what I was aiming for. I then removed the fabric, rinsed the excess dye in the sink and left to dry in the shade. For my linen fabric I wanted a paler shade of yellow, so I diluted the dye bath by pouring some away and topping up with water, and then submerged the fabric, allowing it to simmer gently for about 15 minutes before removing, rinsing and drying. The result of this is an incredibly subtle, pretty lemon colour which I absolutely love. With all this dyeing malarkey going on, my 14 year old self got very excited and I couldn't stop myself trying out a bit of tie dye. This shibori tutorial gave me some ideas for how to bind the fabric, some of which turned out more successful than others. Obviously the most exciting moment is when you remove the ties/bands and the beauty of the tie dye reveals itself! Generally I found that tie dye worked better with the turmeric dye, perhaps because it is more vibrant, but I also love the soft, faded effect you get with the avocado dye when you cover some parts of it. So these are how my experiments turned out, and I am really pleased with them for a first attempt! The avocado creates such a beautiful dusky tone of pink that you rarely see in pre-dyed fabric, and which I have completely fallen in love with. One of my favourite aspects of using natural dye is how much experimentation is involved and how much variation is created - completely unlike chemical dyes. Each element - the quality and type of the avocado, the length of time the dye is heated, the time the fabric spends in the bath - has an effect on the end colour, and that's what's so exciting about it! I'm completely smitten with my little natural dyed baby clothes. I have been a bit unimpressed by lots of the baby clothes in the shops, and shocked at how expensive they are. Buying cheaper white basics and dyeing them myself allowed me to inject a bit of my own taste into the baby's wardrobe, and create something that is unique. Hopefully baby will like its little homespun clothes and will appreciate the effort that went into them (haha, who am I kidding?!). I have some other baby DIY's up my sleeve so check back if this is of any interest to you! !